I wanted to share with you how my husband and I managed to have our wedding be Ours instead of Someone Else's. We had two weddings! The first was everything we wanted--a great party with all our closest friends and family, just 40 people, with homemade food, a weekend long party, and in our backyard. The second was eight months later (last weekend, in fact), at my mother-in-law's house, with all our family members who either couldn't travel to the first wedding or who we didn't want to invite because we were looking for more of a party atmosphere than a family reunion. Our parents planned most of the second wedding, and because we had already planned the wedding exactly how we wanted it, we were fine letting other people's priorities take over on the second one. We invited another 40 relatives, and asked them all to bring food to share. We wore our wedding attire (two weddings is also a great excuse to wear your wedding dress again! ), and restated our vows, and the relatives were really glad to be involved. Liz is finishing up her last semester of law school and Mike is completing his first year of teaching middle & high school band & choir. They bought a house two years ago and live with four roomies, like a little family. They're figuring out how to garden and grow veggies, as well as manage their hectic lives and still remember to say hi to each other once in a while! 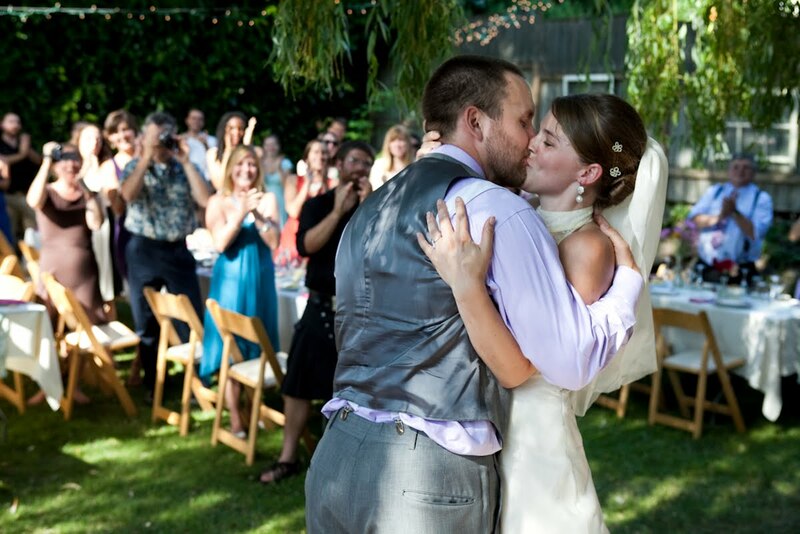 They met working on an island conference center in New Hampshire, and started dating five years later when Liz moved to California. She proposed to him on top of an abandoned castle in the Tuscan countryside, and they got married (the first time!) this August in their backyard! She wore a dress her mom and she designed and she sewed, and Mike wore a suit from Goodwill and went barefoot. They made all the food, with the help of many friends, played bocce ball during the reception, had a huge dance party, and had a blast. 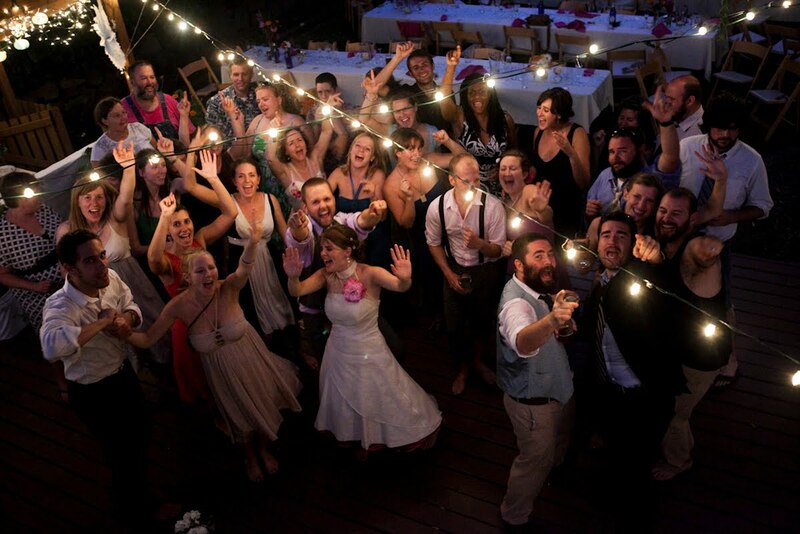 Your turn: Do you have something you want to share with 2000dollarwedding kindred spirits? Maybe you want to write a post about how to DIY your wedding invitations or you want to share a profound realization that helped you approach wedding planning a little more sanely. Maybe you want to write about the name-changing dilemma or a creative idea for making your wedding more eco-friendly. If so, e-mail me your idea. for inspiration, check out other guest posts. We're looking forward to hearing from you! This is a good way to compromise if there is too much divergence on how the wedding should happen. So long as someone's okay having theirs be the "repeat" wedding then everyone can have the wedding the way they want it. The dress is great too and it's awesome that the groom found his suit at Goodwill. this is mine and brandon's second wedding. we want it to be everything we never had, something that is fun, and close to free as possible. 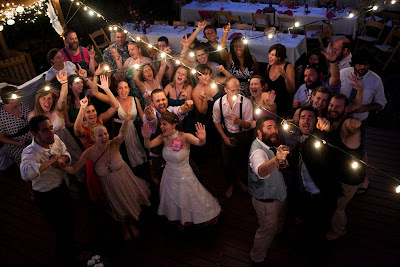 we thought, we thought, and we thought, A CARNIVAL WEDDING! with all the ends: cotton candy, popcorn, string lights, pink blue and red! Thanks so much for sharing our wedding, Sara! It's so fun to see yourself featured on such a great blog! Just to clarify: my mom sewed the dress, not me! Well timed for me! I'm trying to plan the same thing. A Catholic wedding ceremony for the close family and an outdoor cookout in a park for the "family reunion" feel that I've wanted. I'll get to wear my dress twice and say twice as many vows! Great solution! It's nice that you were able to find a way to accommodate everyone involved. Short version: We're having 2 parties, too! One is more our style and the other is to appease other people and a reason to wear my dress again! Long version: We're having two parties as well: the first will be the ceremony and then reception in Michigan, where I'm from, and the second will be just a reception in Barcelona, where he's from. My parents are helping pay for and plan the MI wedding and we're really fortunate in that their taste is similar to ours and we won't have to fight to make it the kind of party we want (in their backyard on a lake) with the people we would want to invite. The Barcelona party, however, is very much "theirs" (his parents'), we're just supposed to show up to the nice restaurant and smile for the pictures with their friends (two thirds of whom I've never met, a third of whom my fiancé hasn't met either!). If it weren't for the backyard party we're having 2 months before, it would really bother me that there's nothing of us in the Barcelona party, but since we'll already have had it in a way that makes us feel good, we don't mind putting on our pretty wedding clothes again (yay!) and going to a party (the only time we mind is when they say things like, "Which flowers do you want? It's your wedding, after all!" because it hasn't occurred to them that this is not even close to the kind of event that reflects us as people and as a couple and they think that by adapting the flowers to our taste they're making it more personal for us). Kahlia- that is so funny that your family is treating the Barcelona wedding like "yours" even though it is entirely theirs - my family did exactly the same thing. "What kind of flowers do you want?" "It's your day - you decide" I was like - no, it is YOUR day, you decide! We had relatives at the second wedding even my aunt, who married into the family 25 years ago, had never met!